The dust jacket for this anthology was justifiably awarded for the subtle arrest of its front visual. The front features a photo-semblance of four prior anthology dust jackets torn back to reveal the newest cover, simple beige paper with blue and beige print used for the title and editor names. This cover also reveals something about the enterprise inside: this newest entry is a beige discretion suffused by its relations to anthology making of the past. The 1164 pages within bear the desire of this anthology to be another in a sequence of Last Words. What is the truth of a place that has only just been worked into language? From Polynesian Mythology to the Yates’ Gardening Guide, Allen Curnow to Alice Tawhai, Samuel Butler to Jenny Bornholdt, writers in this country have struggled for 250 years to work the English language into some sort of truth. 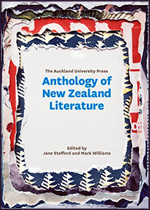 The Auckland University Press Anthology of New Zealand Literature is the first single-volume collection of Aotearoa’s major writing, from early exploration and encounter to a globalized, multicultural present. In fiction and non-fiction, letters and speeches, stories and songs, the editors unearth the diverse voices of the New Zealand imagination. And for years to come this anthology will be our guide to what’s worth reading—and why. Let’s start with the claim to ‘truth’: such a claim orients itself immediately in relation to untruth, to the (thereby implicitly) wrong or lying things that have been presumably excluded or avoided in the present instance. In other words, rhetorically speaking, anything not included here is in the camp of ‘untruth’. Then let’s move to ‘only just been worked,’ put that phrase against ‘250 years,’ and wonder about the claim to literary ‘recency.’ A quarter-millennium year count is considerable; it exceeds, for example, the founding of the United States of America (1776), whose literature no longer has any truck with recency bids. Let’s now pause to note the inclusion of the Māori place name Aotearoa (‘Land of the Long White Cloud’), here wedged into the middle of the back cover blurb rather than, say, included in the title of the book itself. But then, that placement fits with the idea that this ‘place’ has ‘only just been worked into language.’ Perhaps a better word would have been ‘writing’ rather than ‘language,’ since, of course, language has been operating in Aotearoa New Zealand for at least 700 years (even if one goes by the most conservative estimates of the arrival of the first human beings). In a way, the marginalising of the Māori place name is right, reflecting the general orientation of the book’s contents. Similarly, the genre summary of the blurb’s penultimate sentence excludes drama and poetry, which at least has the virtue of according with what has been mostly excluded from the anthology. Finally, let’s consider the head count slippage between the final two sentences. First, this anthology’s choices are attributed to ‘the editors’ – two people – and then the blurb opens to a ‘we’ that, presumably, includes everyone in the world, or in Aotearoa New Zealand at least. One could, at a stretch, read that ‘we’ as indicating that the two editors will use this book as their guide for years to come. The unpacking of this blurb uncovers the fault lines of any anthology. Entries in a book like this are chosen by one or two people – occasionally by a small committee of persons – to achieve some moment in disciplinary assumptions and designs. It then is packaged as a broad guide to knowing. The slip between editorial choice and objectified assertion of generic authority is the problem here. The situation is not unlike the leader of a country making a decision and then having to carry out rhetoric that naturalises that choice, as though it were the only and best choice to have made for that place and time. This entry was posted in BOOK REVIEWS and tagged Jane Stafford, Lisa Samuels, Mark Williams. Bookmark the permalink.